We no longer use this web-interface. It is provided here for anyone who may find it useful. 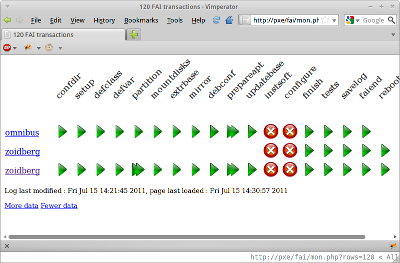 FAI can log progress of client installations through faimond. The usual way of monitoring this logfile is with faimond-gui. Some people might prefer a web-interface, which is why we wrote one. [line 3] - your faimond might log elsewhere. [line 4] - that 60 represents the initial number of rows to list from your logfile. You might prefer more. [line 70] - I think you'll need to change that if you want the links to take you somewhere sensible.